Like a lot of us, I grew up being a big fan of popular music, particularly rock and roll that was produced during the 1960’s. If I was lucky, one of my older sisters would purchase some of the records that were currently in vogue, or maybe one of my favorite singers would be making a television appearance. Some of us might have spent a lot of time around juke boxes, or might even been fortunate enough to attend a live performance of a well know recording artist. But if you were like me, chances are your primary source was the radio, whether it while sitting around the house, at a friend’s, or riding around in a car. Of course trying to enjoy rock and roll via the radio meant being at the mercy of the station’s playlist, hearing endless jingles and countless commercials, and having the DJs talk over the beginning and endings of our most eagerly anticipated songs. But not only did we put up with these obstacles and accept them, but most of us would develop a fondness for some of the radio stations, and became, at times, loyal listeners to many of the DJ’s. This could often be problematic, as the story of early Bay Area rock and roll radio is littered with stations being bought and sold, formats being switched, call letters being changed, and on-air personalities constantly being replaced. Radio itself, in the early 1950’s, had gone through a process of reinventing itself. Once the dominant medium for home entertainment, and America’s go to source for news, entertainment and live sports events, the advent of commercial network television in the late 1940’s triggered a fast erosion of radio listeners. By the 1950’s, not only had television lured away some of radio’s biggest stars, such as Jack Benny, Bob Hope and Groucho Marx, but had also captured the lion’s share of bigtime advertisers. With sit-coms, game shows children’s programming now the property of TV, most radio stations knew that to survive, they would need to emphasize the one genre they could deliver better than television…music. It wasn’t long before radio stations all over the United States began developing formats that featured popular music being presented by a host who hopefully, would have an engaging enough personality to prevent his audience to turn the dial hoping to hear another song of their liking. Although the term “disc jockey” dates back to the 1930’s, it was during the 1950’s, and the growth of local radio personalities that the word became commonly applied. In the San Francisco Bay Area, the most successful of local radio star was Don Sherwood, who was KSFO’s morning man throughout the 1950’s and ‘60’s. Billing himself as the “World’s Greatest Disc Jockey,” Sherwood generally played music that was in line with his own tastes, and much of his listening audience…easily listening contemporary selections, performed by Bing Crosby, Frank Sinatra, Rosemary Clooney and various vocal groups. Top 40 radio, the concept of radio stations focusing their playlists primarily on whatever the most current popular songs happened to be started in 1951, although at that time, none of those selections could be considered rock & roll. But everything changed in July of 1955 when Bill Haley’s “Rock Around the Clock” became the first rock and roll record to top the Billboard Pop charts, illustrating the tremendous potential the genre had, not only in terms of record sales, but in attracting a young radio listening audience. Dave Segal, owner of Top 40 stations in Denver and Greenville, Mississippi, acquired the 10,000 watt KEAR 1550 in 1956, changed the call letters to KOBY, and beginning on October 5, 1956, Northern California had its first Top 40 station that featured some rock and roll. Segal ran KOBY on a shoestring, recycling station jingles used on his other stations, assigning aliases to his on-air disc jockeys (names they would have to leave behind when moving on to other jobs) and running numerous contests that featured very cheap prizes. Contests had always been a promotional tool in radio, sometimes resulting in lucky listeners winning significant amounts of money or merchandise…the best Segal would do was the “Name it and Claim it” competition, where the first caller to the station that could identify the particular record being played, would win the 45 rpm record…a 90 cent value. I vaguely remember one KOBY contest called “Break a Record,” where the winning caller got to remove a record from the playlist, banning the song from airing for an entire week. One gal named Susie, the victor of the game, choose the Everly Brothers hit, “Wake up Little Susie” as the song to be “broken,” and banished from KOBY for seven days. Her reasoning…”My name is Susie, and people keep teasing me when the song comes on.” Wow, tough life! As far as KOBY’s disc jockeys, most of them were veteran radio announcers who had had little knowledge or interest in rock and roll, but ever the troopers, they bravely soldiered on, introducing songs by Elvis Presley, Little Richard and Ricky Nelson, probably hoping the craze would blow over in a few years. But despite the lack original promoting, lame contests and out of place deejays, KOBY quickly climbed to number one in the market, demonstrating the power of the music. Of course, KOBY’s success did not go unnoticed, and eventually KOBY would have competition. Looking back, it’s seems surprising that KOBY went unchallenged for over 18 months, and even when KYA 1260 did, in May of 1958 start to move toward a Top 40 format, they took baby steps, allowing rock and roll to be played for only a few hours a day. But really, you can’t blame the radio establishment for any reluctance in embracing rock and roll. Even the oldest Baby Boomers were only between 10 and 12 years of age, and were not yet a demographic with a lot of purchasing power… plus traditional recording artists like Perry Como, Patti Page and of course Frank Sinatra were still selling millions of records. A look at the KOBY’s first ever Top 40 Survey (October 7, 1956) finds Elvis Presley holding down the #1 spot with “Don’t Be Cruel,” but #2 was the easy listening instrumental, “Canadian Sunset” by Hugo Winterhalter, with Doris Day, Johnny Ray and Patti Page all with top ten entries the same week, showing that rock and roll was not yet dominating the charts. But if KYA wasn’t willing to commit to fulltime Top 40, another station was. On the morning of June 8, 1959, KLX 910 became KEWB 910, when a young, pre-Laugh-In Gary Owens introduced Wilbert Harrison’s “Kansas City.” In taking on a Top 40 format, KEWB distinguished itself from KOBY and KYA by hiring a fresh team of DJ’s, all with seemingly comfortable with rock and roll. In addition to Owens, KEWB’s lineup would include Casey Kasem, Bobby Dale, Ron Lyons and the “real” Don Steele. Now with two bona fide competitors, KOBY started losing listeners, and by February of 1960, the Bay Area’s first Top 40 radio station changed its call letters to KQBY, and switched to a beautiful music format. For me, the legacy of KOBY was not just being the first station to bring rock and roll to Bay Area radio, but also introducing many of us to the weekly top 40 (or 20 or 30) music survey sheets. Since the beginning of Top 40 radio, it has been standard operating procedure for stations to flood the area with weekly one page fliers, advising listeners of that week’s most popular songs. Usually distributed at local record stores, these surveys were almost a Baby Boomer equivalent of the Dow Jones Industrial Averages. Week by week, many of us would follow a song’s progress as it would enter the chart at a top 40 position, then rise to its highest slot, then begin a steady decline before disappearing from the survey, usually forever. I followed the top 40 surveys as religiously as I did the MLB National League standings, and I would openly root for my favorite group’s releases to climb as high as possible, sometimes reaching #1. Some of us, upon hearing a song for the first time, started handicapping as to how high a record could go. My friend John was so sure that Herman’s Hermits “Listen People” would reach number one, he bet another friend Bill an undisclosed sum that it would do so…it stalled at #5. Although the Billboard Hot 100 is considered the gold standard for tracking chart performance of current records, the Bay Area radio station surveys were decidedly independent of any national surveys, as a song’s position was determined by the number of sales the record had locally. The Beatles’ “Hard Day’s Night” might have been #1 nationally, but only reached #6 on KYA’s Official Top 30 during the summer of 1964, while the Beach Boys’ “Surfer Girl,” #8 in Billboard, held the #1 position on KEWB’s Fabulous Forty Survey for 6 weeks in August and September of 1963. “Land of 1000 Dances” was a national hit for both Wilson Pickett and Cannibal and the Headhunters, but in Northern California, it was some guy called Round Robin who had the most success with the song, reaching #1 in April of 1965. Then there is the case of the iconic “Louie Louie.” Although the best known version of the song was recorded by the Kingsmen, whose release reached #2 on the Billboard Hot 100 in December of 1963, it was the Paul Revere and the Raiders rendition that the Bay Area preferred. Not only was “Louie Louie” a hit for Paul Revere in San Francisco during the fall of 1963 (reaching #5), but it reappeared on the Bay Area charts in June of 1965, climbing as high as #2 on the KYA survey, and remaining in the Top 10 for nine weeks…I wish I knew why. It was in 1960 that KYA began the two year process of putting together the Bay Area’s most remembered rock and roll broadcast team. In July of that year, the station hired a deejay who went by the name of Johnny Raven to work the late shift. Advancing to program director, Raven, who would become better known as Les Crane, went about hiring on-air personalities who seemed to be as hip as the music they were playing. In August, Bobby Mitchell was added to the line-up, followed months later by Tom “Big Daddy” Donahue. In August of 1962, Russ “The Moose” Syracuse and Tommy Saunders joined KYA, but the station’s most significant hire came about in December of 1962 with the addition of Gene Nelson. Unlike many of his counterparts, Nelson never relied on the fast talking, bell and whistle approach to Top 40 broadcasting, but instead, preferred to talk frankly about things that interested him, which included local professional sports teams, television and movies. Manning the 6am to 9am slot, Nelson soon proclaimed himself the “emperor of the airways”, inviting thousands of young listeners to become one of his “Royal Commandos.” Emperor Gene Nelson would soon become KYA’s all-time most popular disc-jockey, and during most of the remainder of 1960’s, his voice was second only to KSFO’s Don Sherwood as Northern California’s most familiar. Nelson and company surged ahead of KEWB as the Bay Area’s leading Top 40 station, but the latter received a well needed shot in the arm in early 1964 with the advent of Beatlemania. On February 9, 1964, the Beatles first appearance on Ed Sullivan’s Sunday night variety show attracted over 73 million viewers, which helped propel their current record, “I Want to Hold Your Hand” to #1 on every known record survey. KEWB’s station managers figured out immediately that playing as many Beatle songs as possible throughout the day would put them at least on equal footing with KYA, no matter how popular KYA’s on-air talent had become. Soon KEWB’s deejay’s (including Bobby Dale and Ron Lyons) were instructed to refer to the Fab-Four as the “KEWBeatles,” and began programing sound bites from Beatle interviews throughout the day, sometimes editing them to give the appearance that KEWB personalities were conducting them. Not to be outdone, KYA presented its first Beatles marathon in May of 1964, devoting an entire weekend to wall to wall Beatles music, which wasn’t easy considering that the entire Beatles catalog at that time was comprised of only 30 or so songs. Although the Beatles would remain popular forever, the “mania” phase of their career was over by 1965, and KEWB settled back behind KYA in the local Top 40 ratings. In early 1966, both KYA and KEWB got some unwanted competition when KFRC 610 switched to a Top 40 format. Aiming for a younger demographic, KFRC streamlined the traditional formula, limiting the playlists to just the Top 30 songs, giving the deejays very little discretion regarding the choice of songs to be played, or even in what order. As lame as it sounds now, KFRC’s new style was a huge success, quickly passing KYA and KEWB in the number of listeners. In the fall of 1966, KEWB threw in the towel, changing its call letters to KNEW, focusing on country music. But by now, change was in the air…rock and roll was progressing, developing a more complex edge as witnessed by the “San Francisco Sound” that was being created by the likes of Jefferson Airplane, Quicksilver Messenger Service and the Grateful Dead. Rock’s original audience was growing older as many were now of college age, and not really interested in the next single to be released by the Monkees or Gary Lewis and the Playboys. Former deejay Tom “Big Daddy” Donahue, who had left KYA to start a local record label, could see a void developing, with too much good, sophisticated music being virtually ignored by the Top 40 am stations. Donahue became a pioneer in FM radio, first with KMPX in 1967, and later with KSAN, giving listeners a chance to hear entire albums, with little in the way of contests or station jingles. Also, more and more automobiles were becoming equipped with tape players, giving drivers still another alternative to Top 40 stations. Of course, KYA and KFRC did not go away overnight, as both stations were able to hang on to the loyalty of the younger Baby Boomers, offering up the talents of men like Dr. Don Rose and Big Tom Campbell. Emperor Gene Nelson left KYA in 1968, and I was much surprised one night, when after listening to the end of a Giants night game on KSFO, to hear Nelson come on, and work the late shift…he stayed there for 25 years. Eventually, the youngest Boomers outgrew Top 40 AM, and with the next generation more inclined towards MTV, Top 40 AM went into steady slide. In 1983, KYA 1260 become KOIT, while KFRC went defunct in 2005. Both stations, in their final years, adapted an “Oldies” format, attempting to recreate their golden 1960’s pasts. Since they were no longer playing current Top 40 music, neither station was bothering to send out survey fliers anymore, which was too bad…I really thought the Paul Revere and the Raiders version of “Louie Louie” was poised to make another run at the Top 10. Note: Probably the Bay Area’s most unique radio station transformation took place in the spring of 1959 when radio mogul Gordon McLendon purchased Oakland’s easy-listening KROW 960. When McLendon announced that KROW would debut its new format on the morning of Monday, May 11, it was assumed that it was going Top 40, as McLendon already owned several rock and roll orientated stations throughout the U.S. Those suspicions increased when KROW, beginning on Friday, May 8, began playing an ear-jarring novelty record called “Gila Monster” continuously over the next 72 hours. What made the gimmick even more memorable was the fact that KROW never acknowledged what it was doing, as its deejays would introduce records by Frank Sinatra and Vaughn Monroe, only to play “Gila Monster” again and again. Finally, on Monday morning, with listeners and competitors alike convinced that KROW was going rock and roll, McLendon himself came on the air and introduced Northern California to KABL 960, “your Beautiful Music station.” It turned out that McLendon felt the Bay Area already had too many Top 40 Stations, and decided to offer older folks an alternative consisting of lush instrumentals, what we now call “elevator music.” Almost immediately, KABL became one of Northern California’s most popular stations. At some point during our formative years, we learn the unsettling truth that nothing is going to last forever, and some things won’t even make it through a decent portion of our own lives. The best athletes get old, our favorite TV shows go off the air, and even the world’s most successful rock and roll band can split up. For me, the harsh revelation that all of my surroundings were temporary came 49 years ago when I found out that the Brick ‘o Gold, my most vital downtown Millbrae business, was shutting its doors forever. The news of the Brick’s closing came as a shock not only to me, but to almost anyone who had grown up in Millbrae during the 1950’s or ‘60’s. The Brick ‘o Gold was more than just small convenience store…for kids like me, unlike Safeway, the Ritz Shop, Hillcrest Pharmacy or Belvini Shoes, the Brick was ours. Established sometime in the late 1940’s, the Brick ‘o Gold was what we would now call a hybrid…part small grocery store, part coffee shop, part soda fountain. Located at 441 Broadway, the Brick was crammed between Millbrae Stationery and Highland Liquors. Overseeing the enterprise was a man named Howard Cobb, a middle-aged fellow with thinning hair, always dressed in a white apron. One of Howard’s most distinguishing physical features was his pale skin color, likely a result of him rarely leaving the place during its 7am to 10pm daily hours. Howard’s devotion to his position as the Brick’s proprietor was legendary, as his consecutive days behind the counter was probably longer than the combined streaks of Lou Gehrig and Cal Ripken. When a 1961 rainstorm knocked out Millbrae’s electricity, Howard Cobb stayed at his familiar post, operating the Brick by candlelight. Although the Brick ‘o Gold sold milk, butter, eggs and most of the other basic food items, in addition to offering a small lunch menu, the real magnet for kids was the Brick’s impressive candy selection. A 10 foot by 6 foot shelf with six layers was home to the largest assortment of gum, chocolate bars, licorice sticks and all-day suckers ever assembled in Millbrae, before or since. Alongside the big name candy novelties produced by Hershey, Mars and Nestle were some of the more exotic items like “Atomic Fireballs,” “Jawbreakers,” “Red Hots,” and “Boston Baked Beans.” Most selections were available for a nickel, but there was also plenty of penny candy that could be had even cheaper. Since the Millbrae Theater sold much of the same merchandise at double the cost, no kid in his right mind would go to a Kiddie Matinee without stopping at the Brick ‘o Gold first. If Howard had also sold popcorn, the Millbrae Theater’s profit margin would have crumbled. I’m not exaggerating when I say that if I were sent 50 years back in time, I could still easily navigate my way around the Brick ‘o Gold…blindfolded. When entering the Brick, there was a 40 foot long aisle, between two shelves of groceries that led to the epicenter of the store. There, on your left would be the counter that held two cash registers, on the right would be the candy shelf, behind which stood the ice cream freezer. Continuing a bit further, on the left was the lunch counter, which held five stools. Additional seating could be found in the right-hand corner of the Brick, as past the candy counter were a couple of booths, usually the territory of older boys, off limits to the younger lads. The space behind the cash register and lunch counter functioned as one big work station for Howard, as he effortlessly bounced between preparing and serving foot-long hot dogs and ringing up candy and grocery purchases. Howard was not a one man band, as he did have help in the person of a gal named Nell, who, much to our continuous annoyance, would charge us sales tax on every transaction, something Howard never did. While sitting at the counter, one could see various fountain drink dispensers lined up against the wall. In addition to Coke and 7up was something called a “Millbrae Bomb” and another labeled “Dragon-Fly.” I never tried either one, but I did ask for cherry syrup in my Coke, and felt pretty cool in doing so. Throughout the Brick were handmade signs, assumingly written by Howard himself, which would advise us to any specials available that day. I remember seeing a tray of day old donuts, that were accompanied by a sign, “Today’s Bargain…Donuts 2 for 5 Cents.” The next day, the sign was updated, “Yesterday’s bargain, today’s special…Donuts 2 for 5 cents.” That sign, along with the donuts, stayed there for years (hopefully not the same donuts). Unfortunately, there was a bit of a dark side to the Brick ‘o Gold experience. For some youngsters, the Brick was the setting for their first, and hopefully only foray into the world of crime. As reasonably priced the Brick’s candy was, there were those among us that couldn’t resist taking advantage of the lax security standards of the store, and would slip a Milky Way into their pockets while Howard was busy slicing a tomato. Copping merchandise from the Brick was considered a rite of passage in Millbrae, often done on a dare. It pains me to confess that I’m not exactly approaching this issue with clean hands, although my one offense was not premeditated. One afternoon, I was at the Brick’s candy counter, in the middle of making that day’s selections when Howard complained that my bicycle was blocking the front door, and ordered me outside to move it. When I got to my bike, I realized I was holding a Look Bar, a Big Hunk and box of Milk Duds. I jumped on my bicycle, and just kept riding…Jesse James never made an easier escape. But that ended my life as a shoplifter…unlike Butch Cassidy, I quit while I was ahead. Like most other kids, my visits to the Brick ‘o Gold came during summer days, weekends or after school. One day, in a flash of out of the box thinking, I decided to ride my bike downtown before school, and bring back a bag of Brick candy prior to the first period bell. Arriving at the Brick minutes after its 7am opening, I witnessed a side of the Brick that I never knew existed. The place was full of policemen, postal workers, firemen and cab drivers all enjoying a hearty breakfast, while Howard Cobb, obviously in his element, was joyfully “slinging hash” behind the counter. It was the only time I felt out of place at the Brick. In early 1965, Millbrae went through a construction boom that included a brand new complex of commercial enterprises on the 500 block of Broadway. Suddenly, most of the businesses in the older downtown area had freshly minted counterparts to contend with. But despite the appearance of Britts, Walgreens, Millbrae Square Delicatessen and Baskin Robins, it was generally felt that the Brick ‘o Gold’s business model was still unique enough to withstand the competition. So it came as an unpleasant surprise in September of 1965 when the word spread the Brick would be shutting down at the end of the month. Not wanting to believe it, I immediately ran downtown to find out for myself, only to have the news confirmed in the Brick’s front window, courtesy of one of Howard’s handwritten signs. The next couple of weeks were almost surreal, as Howard simply opened his doors each day, and allowed his inventory to dwindle down to almost nothing. Seeing the empty shelves and the bare walls was almost too much for me to take, but I still went there every day, almost like I was attending a never ending funeral. I wasn’t alone in my grief. One of my best friends made a huge score, buying an entire cardboard box of Double Bubble for pennies on the dollar, only to find himself unwilling to chew up any of the gum…he realized he had purchased a priceless souvenir, and instead kept the entire box intact for many years. As the month came to an end, the Brick ‘o Gold’s lights were shut off, and an era quietly came to a close. I never learned why the Brick closed, although I heard plenty of rumors. Some said that the Board of Health shut Howard Cobb down due to unsanitary conditions, while others said his appliances and electrical systems were not up to code, and Howard could not afford the mandatory upgrades. There was speculation of rental increases and decreasing revenue, and even talk of some embezzlement on the part of Nell…but whatever the reason, it really didn’t matter. The Brick was gone, and so was Howard Cobb. Where Howard went, I never knew for sure. I was told he went on to become a milkman, which would have been just his luck to latch on to another dying occupation. The last known sighting of him was at Belivini Shoes, where Howard was seen buying a pair of cowboy boots, which at least suggests that he was finally spending some time outdoors. For me personally, the timing of the Brick’s demise was somewhat symbolic. I had just entered Taylor Junior High, marking the official end to my childhood. Like Little League and Cub Scouts, the Brick ‘o Gold was a boyhood touchstone, and it’s almost fitting that I could no longer return there. A few weeks after the Brick vacated the premises, Round Table Pizza took over the location, and to its everlasting credit, is still there. But during its early days, I wonder if anyone ever went in there and tried to order a “Millbrae Bomb”? Since I rarely read comic books these days, and do not haunt any of the specialty stores that sell them, I am somewhat out of the loop as to the current activities of the comic book world’s most notable residents. So it came as quite a jolt when I learned last week that Archie Andrews, for 70 years America’s favorite comic book teenager, has met a violent death by gunshot in the latest issue of “Life with Archie.” Stunned by the news, I immediately sought out all the information I could find on the matter, and soon found out that Archie’s demise comes with a key caveat. Apparently, the “Life with Archie” series, since 2010, has served as an alternative universe which has allowed Archie, along with his many pals, to finally grow into adulthood, and has followed Archie in two separate storylines, one where he marries Betty, the other having him wed to Veronica. The two stories have been combined, and the “Life with Archie” publication will cease upon the popular redhead’s death. The regular “Archie” title, will continue, with Archie remaining a 17 year old, hopefully forever. Killing off popular fictional characters is certainly not a recent phenomenon. In early ballads of Robin Hood (circa 1450), Robin meets his death at the hands of an evil nun, who bled him to death while pretending to be nursing him back to health. Fans of Sherlock Holmes are aware that Arthur Conan Doyle attempted to bump off his famous detective in 1893 in a short story entitled “The Final Problem,” as Holmes supposedly met his death when he, along with his arch-enemy Professor Moriarty, fell off a cliff near Reichenbach Falls while locked in physical combat. Since Dr. Watson, Holmes’ sidekick and story narrator never actually saw the fatal incident, it was easy for Doyle to bring Sherlock Holmes back to life a few years later with a simple explanation. Perhaps Arthur Conon Doyle was inspired by Jules Verne’s resuscitation of Captain Nemo, who is briefly back among the living in “Mysterious Island” (1874) after supposedly perishing at the end of “20,000 Leagues Under the Sea” (1869). The idea that fictional characters can return from the dead was picked up on throughout the 20th century, a good example being the Frankenstein monster, who after being destroyed near the end of the classic horror film “Frankenstein,” (1931) manages to make several comebacks, starting with “The Bride of Frankenstein” (1935). The comic book world has seen several resurrections, among the most notable being Superman, who was killed by “Doomsday” in 1992, dramatically returning to the living the following year. Unfortunately, some fictional figures have remained dead, including Bambi’s mother in the feature length cartoon, “Bambi” (1942) when she is blown away by a hunter, inflicting unnecessary pain on viewer …horrible. Television has never been immune to having programs losing long running characters, although the reasons for this have varied from show to show. When Jean Hagen decided to give up her role as Danny Thomas’s wife on “Make Room for Daddy,” having the character die was the best explanation for explaining her absence, a situation that was repeated when Kathy Nolan left “The Real McCoys” and when McClain Stevenson walked away from “MASH.” Of course real life deaths have also necessitated eliminating principle members of a cast. When Bonanza’s Dan Blocker passed away in 1972, the role of Hoss Cartwright went with him, just as the character of “Coach” on “Cheers” was terminated when the actor Nicholas Colasanto died in 1985. But in the case of killing off animated characters, the question has to be why? Comic book figures are drawn, not acted, and thus have the ability to remain intact forever. In the long running comic-strip, “For Better or For Worse,” creator Lynn Johnston wanted to inject realism into her daily strips, which included having her characters aging over time. Since pets generally do not live as long as people, Johnston decided in 1995 to end the life of Farley, the family’s Old English Sheepdog . When she confided her plans for Farley to fellow cartoonist Charles Schultz, the Peanuts creator was livid, insisting to Johnston that comic-strip characters are not supposed to die. Schultz jokingly threatened to beat her to the punch by killing Snoopy, thereby lessoning the impact of Farley’s demise. Despite Schultz’s protest, Farley died after saving a young family member from drowning. But far from being apologetic for having Archie blown away, the writers and illustrators of the Archie comic books have reveled in the opportunity to take their characters in many different directions. The “Life with Archie” stories have seen the gang struggle with health, financial and relationship issues, proving that life after Riverdale High has not exactly been “Sugar Sugar.” And don’t think this voyage into uncharted territory is over with the ending of “Life with Archie.” Last year, the publishers of Archie introduced readers to still another Archie parallel universe with a series of stories under the title, “Afterlife with Archie” which finds Riverdale overrun with zombies, including an undead Jughead, who seems to have moved past burgers when he is seen eating Big Ethel alive. All bets are now off when it comes to Archie, except for one notable exception. According to Jon Goldwater, CEO of Archie Comics Publications, Archie and his pals will never be depicted in sexual scenes, and this vow is “unbreakable.” So let me get this straight…it’s ok to witness Archie getting blown away, or watch a zombie version of Jughead commit murder, but I still don’t get to see Betty or Veronica naked? Come on, man! Useless trivia: One of the most unusual TV deaths took place in 1972 during the final episode of NBC’s “Nichols,” which starred James Garner as the title Character. Minutes into the program, Nichols, a reluctant and pacifist sheriff of a small Arizona town, is shot to death in a saloon by a notorious gunman, only to have his murder avenged by his identical twin brother, naturally played by Garner. It was hoped that the newly introduced Garner character, more heroic and aggressive than the original, would boost the ratings for the struggling show. We’ll never know, as the network canceled “Nichols” a short time later. As most of us know, this November will mark the 50th anniversary of the assassination of President John F. Kennedy, and if you weren’t already aware, I’m sure you soon would have been, with the countless numbers of TV specials, newspaper and magazine articles, and new and reprinted books that will shortly be coming our way. A half century later, JFK’s murder not only the most significant event of my lifetime, but also a bonding mechanism that links everyone past their mid-50’s together for what can described as a national shared experience. But President Kennedy’s assassination did more than provide a moment where almost all Baby Boomers can remember where they were the very moment they heard about it…it also kicked off a cottage industry of conspiracy theories, available through several books and television documentaries. Share some time with ten 60 year old Boomers, and you’ll probably come away with five or six explanations of what happened in Dallas on the afternoon of November 22, 1983.
on November 22, 1963, we learned the name Lee Harvey Oswald, and were given a rough sketch of that day’s event at Dallas’s Dealey Plaza. If we weren’t already in a daze, watching Jack Ruby cut down Oswald, live on national television really pushed a lot of us over the edge. Here we were, tuned in to President Kennedy’s funeral procession when the networks cut away to live coverage of Lee Harvey Oswald being transferred from Dallas police headquarters to the county jail, just in time to witness our nation’s first televised murder. Although Oswald’s death deprived us of what might have been the trial of the century, we were already being assured of Oswald’s guilt, and that his conviction was a mere formality. As a means to settle all doubt, on November 29, 1963, President Lyndon B. Johnson established the “Warren Commission,” to investigate the assassination of President Kennedy, which resulted in an 889 page report that concluded that Lee Harvey Oswald had acted alone in shooting the President. Anyone thinking the Warren Commission’s findings would be the final word would be proven wrong soon and often. Described as “the best photographic evidence” of President Kennedy’s assassination, the Zapruder film has long been the centerpiece for anyone studying the actual moment of JFK’s death. Although the footage, shot by private citizen Abraham Zapruder, provides a clear picture of the actual moment of the fatal bullet’s impact, it too, has its critics, going as far as saying the home movie has been altered in order to conform to the Warren Commission’s findings. Of course, the tampering of evidence and harassment of witnesses has always been constant theme. Jim Marrs, who wrote the book, “Crossfire” (1989) presented a list of 103 people having some connection to the assassination, either as a witness or possible suspect, who died “convenient deaths” within a few years of the crime. Every aspect of the Kennedy assassination has been a source of controversy and disagreement among experts. The number of shots fired, Oswald’s marksmanship, the murder of policeman J.D. Tippit, and the legitimacy of Kennedy’s autopsy have all been called into question. To this date, it has been estimated that as many as two thousand books about the Kennedy assassination have been published, with 95% of them having a pro-conspiracy, anti-Warren Commission point of view. It’s no wonder that a 2003 Gallup poll reported that 75% of Americans do not believe that Lee Harvey Oswald acted alone. And new theories continue to find their way into the national discussion, including the most recent one that suggests that one of the bullets hitting Kennedy was fired in error by a Secret Service agent…at least it’s described as an accident. The popularity of Kennedy assassination conspiracy books sparked the beginning of what some have called “conspiracy nation.” Whether it was FDR having advance knowledge of the Japanese attack on Pearl Harbor or Hitler escaping to South America, it seemed that any published work offering an alternative look at any historical event would find an eager audience. Conspiracy theories eventually would attach themselves to practically everything, even the Moon landing, which some people believe was faked. Being skeptical can be a good thing, and not buying into everything that we are told by our government is not only healthy, but sometimes necessary. On the other hand, to reject everything we see or read about as lies can only lead to a paranoid existence. If you provide a “9-11 truther” or an Obama “Birther” with overwhelming evidence that disproves their beliefs, they will simply expand their conspiracy theory to include the fabrication of whatever information you offered. But don’t get me wrong…conspiracy theories have provided me and others thousands of hours of fascinating reading, possibly the only silver lining the Kennedy assassination has provided. went ahead with its Friday afternoon home game against Hillsdale, which was played about three hours after the President’s death. In Marysville, the Beach Boys performed a Friday night concert, as city leaders felt the show would allow kids to get their minds off tragedy for awhile. Brian Wilson later said it was one of their better shows. Trivia: Jack Ruby’s shooting of Lee Harvey Oswald had a direct influence on TV sports broadcasting. Watching Oswald’s killing on television, CBS Sports producer and director Tony Verna was very impressed with rival NBC’s use of replays during their Ruby-Oswald coverage. Verna decided to use the same cutting edge video technology two weeks later during the CBS telecast of the Army-Navy game. On December 7, 1963, after an Army touchdown, announcer Lindsay Nelson advised his viewing audience, “This is not live, ladies and gentleman…Army did not score again.” What viewers were seeing was the first use of instant replay. As one who spent his formative years in Millbrae, I have fond recall of many places that, since my childhood, have either undergone much change, or have disappeared completely. In the case of defunct shops and businesses, the street numbers and buildings still remain, occupied by someone or something that has no relation to what it once was. But there is one enterprise that left without a trace about a half-century ago. Although no physical evidence remains of her existence, Millbrae’s Ice Cream Lady was, for a few years, as much a part of our landscape as any standing structure in town. Between roughly 1958 and 1963, her familiar truck along with its accompanying music roamed up and down our city’s streets peddling frozen ice cream treats for a dime. Combine the fact that she was selling items that were crucial to any kid’s diet with what was an unforgettable persona, you definitely have the makings of a legend, or at least someone with a cult following. Between the mid1950’s and the end of the 1960’s, Millbrae ran through several ice cream men and women, and during the height of the Baby Boom, we often were visited more than once during the same day. The idea of ice cream being sold directly by way of a truck was a holdover from an earlier time when our city streets were full of vendors selling anything from fish to fruit. Food being sold directly from a cart or truck was necessary 100 years ago, as most households did not have available transportation to drive to a store. Another factor was that in pre-World War II America, many homes did not yet have refrigeration units, and many items could only be purchased if they were going to be used immediately. The concept of the ice cream truck is generally credited to the Good Humor Corporation of America, who first took to the streets in 1920 selling chocolate ice bars on a stick in Youngstown, Ohio. What started as one truck selling one item grew to over 2,000 trucks throughout the country, offering as many as 85 assorted ice cream novelty flavors or combinations. The Good Humor Corporation and its competitors followed the population flow to the suburbs, directing most of their sales energy toward the growing Baby Boomer demographic, as 55% of the customer base was 12 years old or younger. Millbrae’s Ice Cream Lady first appeared around 1958. She was somewhat stocky, wore sunglasses and had frizzy hair, but her most memorable characteristics were the hole in her throat, no doubt the result of a tracheotomy, along with the frog-like voice that came from the same procedure. One would like to think that her health situation and her attempt to work through it would evoke sympathy and admiration, but kids are kids, and usually her appearance inspired fear from younger children, and sick humor from the older ones. Normally, she would arrive on my block after lunch usually between 1pm and 3pm. Pinehurst Court consists of 21 homes and, in its heyday, housed over 60 kids, so we must have been considered profitable territory. Since we were also visited by an evening ice cream truck, many of us had developed a two-a-day ice cream bar habit. Unfortunately, I came from a large family, and my mother was seldom willing to shell out seven dimes every time an ice cream truck came rolling up. As luck would have it, my best friend Dougie was an only child, and his generous mom would always buy the both of us ice cream bars whenever I happened to be there, which, coincidentally, was everyday. It was just as well that Doug’s mother was happy to fetch us our treats, as I was afraid of the Ice Cream Lady anyway, as my first dealing with her did not go well…at the age of four, I attempted to purchase a popsicle with four shiny pennies, only to be publicly humiliated when informed that I was quite a bit short. Other children were also weary of her, as she had little tolerance for kids who had trouble making up their minds over which flavor to choose, and the words “hurry up kid, my ice cream is melting” were quite intimidating when delivered with that unforgettable croak. As mentioned, for a while, my block was frequented by two ice cream trucks, as in addition to the Ice Cream Lady, we also had an ice cream man who had an evening route, generally motoring up Pinehurst between 6 and 7pm. As I recall, he was a dark haired man with a mustache, and spoke with a heavy Italian accent. One memorable day, the inevitable finally happened…the Ice Cream Man came too early, and the Ice Cream Lady came too late, resulting in both of them showing up at 4:30. The shouting match that ensued, featuring the woman’s frog voice and the man’s excited Italian, could be heard for blocks. Despite having two ice cream trucks on our block at the same time, very few sales were made, as most of us didn’t want to be seen as taking sides… almost like when our parents fight. I honestly can’t tell you exactly when the Ice Cream Lady stopped coming. Between friends, school, sports and television, even the disappearance of the daily ice cream truck can go unnoticed for several weeks. Although I tend to think that her final days in my neighborhood occurred in early 1963, others assumed she was still selling ice cream in Millbrae years after last curbside stop…kind of a local version of the “Mel Allen Syndrome” (I’ll explain later). Other ice cream sellers took her place, but they too faded away, as the combination of Baby Boomers growing up and the price of insurance and gas caused the eventual demise of the daily ice cream person. In later years, the ice cream truck would make an occasional comeback, including during my daughter’s childhood. Watching my little girl waiting on the curb holding her dollar (yeah, a dollar) almost brought a tear to my eye. I’m guessing Millbrae’s Ice Cream Lady as long since passed away. I’m hoping that, somewhere in the great beyond, she’s at a place where it’s always sunny, and the sidewalks are filled with children holding dimes…she deserves nothing less. Note: Mel Allen was the longtime voice of the New York Yankees, who was unexpectedly fired after the 1964 season. Allen was so closely identified with the Yankees that even years after his departure, baseball fans outside of New York still believed he was the Yankees announcer. Hence the “Mel Allen Syndrome,” which I kind of made up. As a lifelong fan of motion picture science fiction, I’ve never had a problem with suspending my disbelief in the impossible and supernatural, and have willingly allowed myself to accept all kinds of preposterous concepts in order to be entertained. Whether its monsters, vampires, time travel, turning invisible, moving faster than the speed of light, or any of the powers of Superman, I never let the existence of real science get in the way of a good story. But there is however, one phenomenon that I have come across constantly in my many years as a movie and TV viewer that has never ceased to insult my sometimes questionable intelligence…the idea that the majority aliens throughout and beyond our galaxy, whether they land on our planet, or are confronted billions of miles from Earth, speak English, usually better than I do. Although occasionally, the movie in question will offer a lame explanation for this situation, more often than not, English speaking spacemen do not seem particularly strange to native Earthling characters. Don’t get me wrong…I am not critical of English being used in such films. Since the beginning of American cinema, Moses, Jesus, Cleopatra, Marco Polo, Napoleon and Hitler have all been depicted as English speakers. This, of course, is poetic license used to make it possible for filmgoers to follow the story, and understand the characters. Having Alexander the Great (Colin Farell) speak Aeolic Greek would have been laborious for the screenwriters, the actor and the audience. And I wasn’t too concerned during “Ben-Hur” (1959) when Judah Ben-Hur (Charlton Heston), Messala (Stephen Boyd), Quintus Arrius (Jack Hawkins) and Sheik Ildirim (Hugh Griffin) all conversed effortlessly despite being from different parts of the Ancient World. My problem is when Captain Kirk (William Shatner/Star Trek) and some space alien from a planet million light years away, meet for the first time, and immediately begin talking like they both shared the same college English professor. Early examples of English speaking aliens are found in many of the movie serials that were popular in the 1930’s and ‘40’s. In the 13 chapter “Flash Gordon” (1936), adventurer Flash Gordon (Buster Crabbe) travels from Earth to the planet Mongo, ruled by the evil Ming the Merciless (Charles Middleton). Mongo is different from our planet in one respect: Earthlings speak in dozens of assorted languages, while on Mongo only one is used…English. Neither Flash or Ming seem to notice this peculiar occurrence, but maybe in the heat of battle, an oddity of this sort can be overlooked. Naturally, Flash Gordon is eventually successful in causing Ming to be overthrown, but unfortunately Ming returns in the sequel, “Flash Gordon’s Trip to Mars” (1938). Ming, this time, is working in concert with Azura, Queen of Mars, in a plot which they hope will result in their conquering Earth. As you might have guessed, English is spoken on Mars, as demonstrated in Chapter 7, when Mongo asks one of the Martian army officers if they were “successful in capturing the Earthman, Flash Gordon?” What was the Martian officer’s reply? “Yep.” After completing one more Flash Gordon serial, Buster Crabbe went on to star in “Buck Rogers” (1939), which takes place in the 25th Century., a time when the Earth is run by a ruthless dictator, Killer Kane (Anthony Warde). Hoping for assistance in ridding his planet of Kane, Buck goes to Saturn, where, of course, everyone speaks English. I don’t know, maybe they all learned it in anticipation of someday visiting Earth…or Mars…or Mongo. 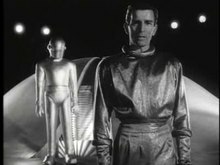 At least the science fiction classic, “The Day the Earth Stood Still” (1951) had the decency to make an effort to account for the alien Klaatu’s( Michael Rennie) perfect command of the English language, which was apparent moments after he walked down the ramp of the spaceship that carried him to planet Earth. Not only does Klaatu make it clear that his knowledge of English is merely a result of his careful study of our culture, but he also teaches Earthling Helen Benson (Patricia Neal) a few words of his native tongue, although audiences never did learn exactly what “Klaatu barada nikto” actually meant. My only problem is that if Klaatu was really a true observer of America circa 1951, I’m guessing he would have demanded to meet Milton Berle or Howdy Doody rather than the President. Even when there is a rational reason for English being used in places it shouldn’t, too often the characters in the film don’t seem to care one way or another. In “Planet of the Apes” (1968), astronaut George Taylor (Charlton Heston), finds himself on a planet run by clothes-wearing, gun-toting, speaking apes. 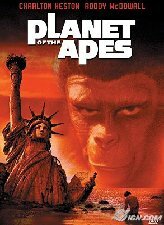 Although those of us familiar with the movie know that Taylor was unknowingly back on Earth, Taylor didn’t know it, yet he showed not even an ounce of curiosity over the fact that all of the apes spoke English. Maybe he thought he had landed on Mars…or Mongo (ok, I won’t use that line again). Useless Trivia: In “The Adventures of Robin Hood” (1938), Robin (Errol Flynn) has a chance encounter with King Richard I (Ian Hunter), who has unexpectedly returned to England from the Crusades. Although Robin Hood and Richard “The Lion-Heart” converse effortlessly, this is historically inaccurate. Robin Hood was a Saxton while King Richard was a descendant of the Normans who conquered England in 1066… Richard I, who spent very little time in England during his 10 year reign as King, never bothered to learn English. If ever we needed a reminder that all of us are potentially expendable, it certainly came recently when George Zimmer, founder and longtime commercial spokesman of Men’s Warehouse, was ousted as the company’s executive chairman by its board of directors. Citing Zimmer’s desire to sell the clothing firm to private investors as contrary to the board’s wishes, Zimmer was dismissed from the company he started in 1973, and where he has been its public face for as long as anyone can remember. As surprising as this development may seem, Zimmer is not the first individual to become estranged from an enterprise he or she seemed permanently linked to, as the following examples will attest. Although McDonalds was founded by a pair of brothers, it was businessman Ray Kroc who successfully turned a small burger chain into a multi-billion dollar corporation. In 1953, Kroc was a multi-mixing milkshake machine salesman, who became intrigued when Richard and Maurice McDonald, owners of a small hamburger restaurant in San Bernardino, ordered eight of his mixers. Kroc saw the huge potential of the McDonald’s operation, and convinced the McDonald brothers to allow him to aggressively franchise their business. By 1961, Kroc had become frustrated by his two partners’ intent to limit the number of McDonald restaurants to only a few locations, so Kroc offered to buy them out for $2.7 million dollars, plus 1.9% of future royalties. (It was a handshake deal, which allowed Kroc to renege on the royalties, due to it not being in writing). As part of the agreement, Richard and Maurice were able to retain the San Bernardino property, where they opened a hamburger stand called “The Big M.” In brutal fashion, Kroc surrounded “The Big M” with a number of McDonald restaurants, forcing the actual McDonald boys out of the burger business forever. Colonel Harlan Sanders franchised his first KFC (Kentucky Fried Chicken) restaurant in 1952, and today, 32 years after his death, remains the official face of the company. But his relationship with the business he founded did not always go well during his lifetime. After selling the KFC Corporation in 1964 for $2 million dollars, Sanders eventually went on to become the company’s most strident critic. In 1973, the Colonel sued KFC’s parent company, Heublein Inc. over alleged misuse of his image and associating his name with products he had not helped develop. Two years later, Heublein unsuccessfully sued Sanders for libel after he publically compared KFC’s gravy to “wallpaper paste.” I always thought it was the wallpaper industry that should have sued. For much of their existence, the Beach Boys were a family operation. Not only were three of the California rock group’s founding members brothers (Brian, Dennis and Carl Wilson), but also, during their formative years, their manager was the Wilson boys’ father, Maury Wilson. This arrangement made sense in the early days, when the Beach Boys were not yet a major act, and a concert tour simply meant loading up the family station wagon. At the outset, managing the group was no more complicated than coaching a little league team, but by 1964, the Beach Boys were selling millions of records, and the job had outgrown Maury, whose previous occupation was selling industrial equipment. Not only was Maury inexperienced in the higher echelons of the music business, but he also constantly blurred the line between manager and father, imposing strict curfews on the road, fining the boys for tardiness and bad language, and even maneuvering band member David Marks out of the group in 1963. Even worse, Maury, a frustrated songwriter, began to battle with son Brian over the musical direction of the group. In late 1964, the Beach Boys had had enough, and fired dear old dad right before their first ever European tour. Eager to prove that he was the reason for the Beach Boys’ success, Maury Wilson found five other young men, and used them to form a Beach Boys clone group called the Sunrays, who enjoyed only brief and moderate success. But Maury still had his hands in the Beach Boys’ pocket, as he co-owned the royalty rights to the group’s songs with son Brian. In 1969, without Brian’s permission or knowledge, Maury song the entire catalog to A & M records for a reported $700,000, a fraction of its value. In 1990, 17 years after Maury Wilson’s death, Brian Wilson successfully sued the law firm he felt had misrepresented him in the transaction, and collected $25 million dollars in lost revenue and unpaid royalties. After that settlement was completed, Beach Boys lead-singer Mike Love sued Brian for an equal share of the court winnings, claiming that Brian and Maury had withheld songwriting credit from Mike on 35 songs. Mike went on to win that legal battle, and the acrimony it caused between Brian and Mike demonstrated Maury Wilson’s ability to create problems from the grave. Then there are those that held cushy positions as TV spokespersons for high profile products, only to be done in by their own foolish behavior. Entertainer Anita Bryant was hired by the Florida Citrus Commission in 1969, and was featured singing “Come to the Florida Sunshine Tree” for almost a decade until her outspoken stance against homosexuality led to her contract being allowed to lapse. Actor Ben Curtis had a sweet gig as “Steven,” the Dell Computer lad beginning in 2000, but his popular “Dude, you’re getting a Dell” commercials ceased in 2003 when Curtis was arrested for criminal possession of marijuana. And who can forget the lovely young model appearing on the box of Ivory Snow soap 40 years ago? One can only imagine Proctor & Gamble’s embarrassment when that same model, Marilyn Chambers, turned up in the pornographic film classic, “Behind the Green Door.” I still wonder what “99 & 44/100% pure” was supposed to mean. But there is another example that may cause George Zimmer to take heart. In 1985, Steve Jobs, co-founder of Apple Computer, was driven out of the company he helped start, when CEO John Sculley successfully pulled off a boardroom coup. Rather than conduct a lengthy lawsuit, Jobs founded NeXT Computer with $7 million. Attracting outside venture capital, Jobs made NeXT Computer a success, and in 1996, sold the company to Apple for $427 million. Apple’s acquisition of NeXT brought Steve Jobs back to Apple, where he eventually became CEO. I can hear the wheels turning in George Zimmer’s head as we speak. Among the motion pictures bring released in the summer of 2013, is the film “This is the End,” starring Seth Rogen, Jonah Hill, Jay Baruchel and James Franco. The unique aspect of this comedy is that all of the principle actors in the movie portray themselves, or at least a remote version of who they are. This approach has been a popular trend, mostly on television, for the past several years, as many celebrities have appeared semi-regularly on various programs playing fictionalized , and often, unflattering versions of their true identities. James Van Der Beek (“Don’t Trust the B… in Apartment 23”), Will Wheaton (“Big Bang Theory”), Seth Green (“Entourage”), and Regis Philbin (“How I met Your Mother”) have all made the sitcom rounds giving over the top performances, spoofing their show business personas. Of course, a few personalities have made creating humorous send-ups of their lives the basis for an entire series, as witnessed by Larry David’s “Curb Your Enthusiasm” and Matt LeBlanc in “Episodes.” Although this may appear to be a recent development, the idea of a celebrity playing his or her self is a concept that dates back over 90 years. Magician Harry Houdini used his fame as a master illusionist in the 1920’s as the basis for several silent films which starred the magician as himself, using his stage skills to solve crimes Decades later, both Gene Autry and Roy Rogers, having established themselves as the motion picture industry’s top screen cowboys, began to exclusively play characters the shared their well known names. In fact, in some of Roy’s later films, the scripts acknowledged that he was a well known movie star, who still found time to battle cattle wranglers during his spar time. Obviously, fact and fiction were being blurred, and even a young boy like me wondered how many cow thieves existed in California during the 1950’s. And why wouldn’t Roy just call the police? It was Jack Benny who really seemed to straddle the fence between real and fictional, as his long running series seemingly gave us a behind the scene glimpse of his private life. As a kid, I marveled at who much attitude Jack’s butler Rochester seemed to get away with, and wondered how his long suffering girlfriend, Mary Livingston, put up with him. It was only as an adult that I learned that Rochester was actually an actor named Eddie Anderson, and never lived with Jack Benny, unlike Mary Livingston, who did live with Jack, probably because they had been married for several years. Of course the all time best example of people playing somewhat altered versions of their real life selves was the classic sit-com, “The Adventures of Ozzie and Harriet,” Starring all four members of the Nelson family, “Ozzie and Harriet” certainly had viewers convinced they were watching a typical American family go through life on a weekly basis. The Nelsons were a real family, and even the indoor sets used on the program were based on the Nelson’s real Hollywood home. But how closely did the show depict the Nelson’s actual life? Well, first of all, they appeared to be living an upper-middle-class existence, unlike the rich show business individuals they really were. Ozzie Nelson seemed to be without a job, constantly hanging around the house, avoiding any possible chores Harriet tried to give him. The real Ozzie was a workaholic, serving as director, producer, writer, as well as one of the principle performers on his show. But the biggest disconnect had to do with Ricky Nelson and his music. “Ozzie and Harriet” often featured Rick fronting a rock and roll band, usually playing in front of the number of people it took to fill his living room. In reality, Ricky Nelson was one of the biggest recording stars of the late 1950’s rock and roll era, and was selling millions of records during his years on the show. Having his records featured on the program certainly didn’t hurt Rick’s record sales, and his presence on the show obviously helped with the ratings, a kind of synergy that worked for another series, that debuted in 1966, the same year “Ozzie and Harriet” went off the air. Although “The Monkees” was to be a TV show about a fictional struggling rock group, producers at Columbia Studios originally wanted to cast an existing band to star on the NBC series, but most groups were already signed to a record label, prompting the production to use four guys who had never previously worked together. Inspired by the Beatles’ “A Hard Days Night,” “The Monkees” was a comedy show, using music recorded by Mickey Dolenz, Mike Nesmith, Davy Jones and Peter Tork throughout the 30 minutes, a forerunner to the music videos that came into vogue a decade later. Having the four men use their own names on the program turned out to be a good idea, as “The Monkees” soon became one of the most popular recording acts in the country, and fans were never asked to remember more than four names. Eventually, “The Monkees” became a touring band as well, playing reasonable versions of their hits onstage, despite Jones and Dolenz having limited instrumental skills. Ironically, Dolenz-Jones-Tork and Nesmith kept the group together even after the show was canceled, with two or more of the members performing together right up until Davy’s 2012 death. It would almost like if the cast of “Cheers” opened a bar after the completion of that series. However, I would guess that the most successful television show featuring a star portraying a facsimile of his self was “Seinfeld,” where Jerry Seinfeld was featured as a character that shared Jerry’s real life name and occupation. In the “Seinfeld” universe, Jerry was a fairly successful comedian, living in a one bedroom apartment in New York City, hanging out with ex-girlfriend Elaine, longtime buddy George, and his neighbor from across the hall, Kramer. Although his three companions were fictional, Jerry’s lifestyle depicted on the series may have accurate at one time, but as “Seinfeld” became a hit show, the real Jerry Seinfeld was worth millions of dollars, and no longer had people like “Newman” anywhere in his life. Reality shows involving everyday people have flooded the airwaves over the past decade, making it, at times, even more difficult to dissemble what is real and what is scripted.. And while that’s been happening, network sitcoms, such as “The Office,” and “Modern Family” are presented in documentary style, reflecting, I think, the notion that everyone of us probably think their lives are interesting enough to be televised. This concept was the inspiration for a movie, “The Truman Show” (1998) where Truman Burbank (Jim Carrey) was raised from infancy to adulthood in front of a television camera. The film’s twist was that Truman was the only person unaware of the situation, as his hometown was merely a giant-like bubble filled with hundreds of actors pretending to be his friends and neighbors. When Truman discovers the ruse, he opts for a regular life, and sets out for the real world. One wonders how many of us would have done the same. If you were ever searching for a candidate for the quintessential Baby Boomer “coming of age” movie, you couldn’t do better than “American Graffiti,” the Francis Ford Coppola produced teenage comedy that will soon celebrate its 40th birthday. Released in the summer of 1973, the impact of “American Graffiti” went well beyond the film’s immediate popularity, and success at the box office. Not only was it the motion picture that propelled George Lucas into the A-List of movie directors, advanced the careers of Richard Dreyfus, Harrison Ford, Cindy Williams and Suzanne Somers, reestablished child actor Ron Howard as a star, and placed legendary cult DJ Wolfman Jack into the mainstream, but also was responsible for igniting a 1950’s, early ‘60’s nostalgia craze, that led to TV shows like “Happy Days,” and “Laverne and Shirley.” But “American Graffiti did much more than make money and launch careers…it struck a cord with audiences, particularly those between the ages of 17 and 30, who proved more than willing to revisit a period that was only a decade earlier, but from which they felt eons removed from. The origin of “American Graffiti” stemmed from young filmmaker George Lucas’s desire to pay homage to the teenage pastime known as cruising, especially how it was practiced in his hometown of Modesto in the early 1960’s. In addition to recreating the Friday night ritual, Lucas also wanted to incorporate the infatuation he and many others had with the mysterious radio personality Wolfman Jack, which ultimately led the picture to rely on classic rock and roll oldies rather than a typical music soundtrack. With the help of screenwriters Willard Huyck and Gloria Katz, a 15 page film treatment entitled “Another Quiet Night in Modesto” was completed in 1971, and pitched by Lucas to several motion picture studios, with no luck. Finally, Universal Pictures stepped in and agreed to finance and distribute “American Graffiti,” giving George Lucas a $600,000 budget, which was increased to $775,000 when Francis Ford Coppola signed on as producer. Filming began in June of 1972, and although it’s set in Modesto, Lucas felt his hometown had changed too much in 10 years, and did most of the location filming in Petaluma. “American Graffiti” opens at Modesto’s Mel’s Drive-In, as four buddies, on the cusp of adulthood, assemble in hopes of making the final summer night of 1962 a memorable one. Curt (Richard Dreyfus) and Steve (Ron Howard) are slated to fly off to a Northeastern college to next morning, but while Steve is eager to leave his “turkey town,” Curt is reluctant to part from his familiar surroundings. Terry “the Toad” (Charles Martin Smith) seems oblivious to his future, and is more concerned with shedding his image as the town dork. John Milner (Paul Le Mat) is actually already an adult, and one can easily sense his depression that now, even his younger friends are outgrowing him. Milner’s only real accomplishment is his reputation as the guy with the fastest car, and even that is in jeopardy, as he learns that some guy from the valley has arrived in town to take away his title. Soon, the four separate, and the film follows each of their evening’s exploits. Steve spends most of his night in constant battle with his girlfriend Laurie (Cindy Williams) as the two must come to grips with how Steve’s leaving will affect their relationship. Toad, emboldened by being given the use of Steve’s 1958 Impala, somehow manages to pick up the girl of his dreams, the lovely but ditzy Debbie (Candy Clark). Meanwhile, Milner ends up being tricked into driving around with the mouthy 12 year old Carol (Mackenzie Phillips), and spends the night trying to unload her, all while looking over his shoulder for his latest drag-race challenger, Bob Falfa (Harrison Ford). But it’s Curt’s story that is the most compelling. Early on, he sees what he feels is a vision, in the form of a beautiful blonde in a T-Bird (Suzanne Somers), who seems to flirt with him at a stoplight. While hoping to catch up with her, Curt wanders aimlessly, as he confides with his former teacher, briefly hooks up with an ex-girlfriend, and finally falls in with a pack of hoods known as the “Pharaohs.” As the night wears on, Curt slowly starts to feel out of place, as some of his illusions are shattered, especially when he learns everybody’s favorite myth-like radio personality, “the Wolfman,” is just a guy who never made it out of local radio. It’s easy to see why “American Graffiti” resonated so deeply with so many Baby Boomers. 1962 was the final year of innocence of a decade that was supposed to be known as the New Frontier. A year later came the JFK assassination, followed by the Vietnam War, social unrest, more assassinations, and finally, the revelations of the Watergate scandal. 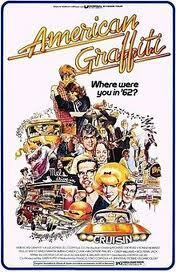 Although “American Graffiti” was set a mere 11 years before the film’s release, 1962 and 1973 seemed like night and day. Much of the film’s impact is hard to feel in 2013, as 1962 and the events that followed are now very distant memories, but I’m wondering… if today, someone made a period piece movie about 2002, would it have the same effect “American Graffiti” had 40 years ago? What do you think? Notes: Strapped with a low budget, “American Graffiti” went on to earn over $200 million dollars, and allowed George Lucas to set aside seed money for next big project, which became “Star Wars” (1977). The “Wolfman’s” radio broadcast, which is featured throughout the movie, included 41 original recordings from the rock and roll era. The licensing rights cost the production $90,000, but since RCA demanded more than could be spared, Elvis is nowhere to be heard. As “American Graffiti” ends, an on-screen epilogue reveals the eventual fates of the four principle characters. Lucas was criticized for not including the females, but he felt that that would have made the epilogue too lengthy. Universal Studios was not happy with “American Graffiti” as the movie title, feeling it sounded like an artsy foreign film. Lucas was given over 60 alternative titles to choose from, but he stuck with his original. An early script had the blonde driven T-Bird motor completely through Mel’s Drive-In after closing hours, revealing both the car and the girl to be ghostly figures, but the budget would not allow for such a costly special effect, and the idea was abandoned.